The last page of the Baltimore News contains every day a cartoon, with the signature of that gentleman, and in nine cases out of nine the cartoon contains an idea portrayed with the odd combination of subtlety and clearness — subtlety to please the keenest and clearness to strike the most obtuse between the eyes. The idea is usually unique in its conception, yet so palpable when once it is exploited in Barclay's bold, yet artistic lines, that the beholder involuntarily exclaims to himself: “Well, I’ll be dogged! Why couldn’t I have thought of that?” And the paragraph, poem or picture that so impresses humanity is the ideal in its specific line. It has hit the universal, and that means success. The peculiar geographical position of Baltimore makes her newspaper men labor under such restriction as no other city of Baltimore's size anywhere has known. The men who work in this field must do so with a constant knowledge that their work is for the local field primarily and that only extraordinary brilliancy or a particularly universal hit can ever hope to reach the garish day of wider publicity. Under this handicap, Mr. Barclay works with zeal, filling his niche to overflowing and giving to the people of Baltimore a service second to none in the entire country. His cartoons do, in the most satisfactory manner, everything a cartoon was ever intended to do. His pictures are editorials with the weight of the leader and the pungency of the paragraph. They speak for themselves, and so great is their merit that they are copied far and wide throughout the country. Like all good cartoonists, Barclay, has a personality that has even the best of his published work beaten many many city blocks. And to know the best and most delightful of him one has to know him, with his quaintness and his keenness. Every sentence is a cartoon visible as well as audible. He is a humorist of the finest, truest type, and can write as cleverly as he draws. Here is a Bordenized ante-mortem obituary of him: He was bred in old Kentucky. First endowed with his services the Princeton (Ky.) Weekly Banner, in whose office he up-ended the elusive types occasionally making a woodcut on white pine. None of these first cuts is in the Congressional Library collection, so it's no use to look there for them. 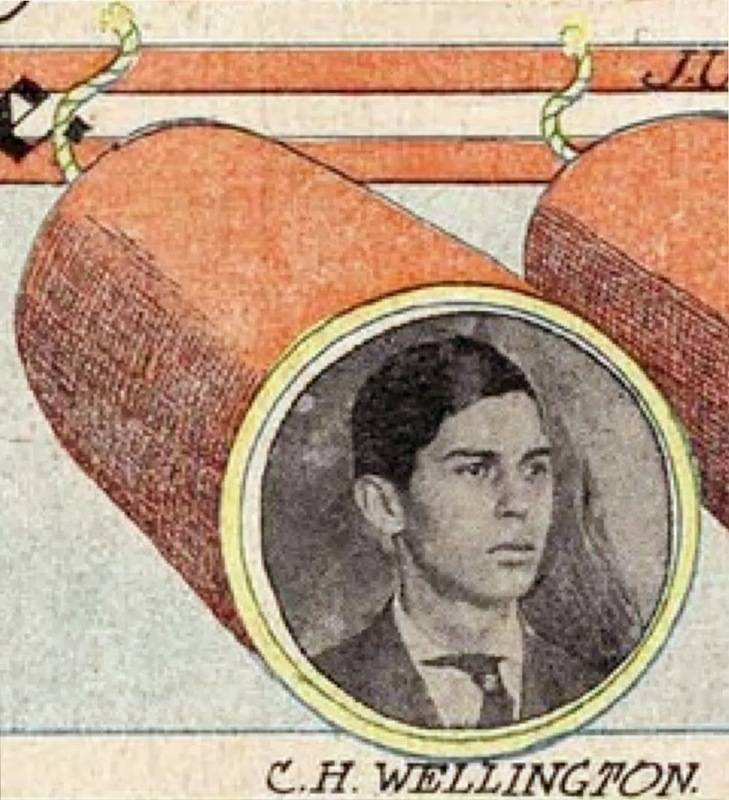 Being entirely impartial, he amputated himself gently but firmly from the Banner and tackled his first daily job on the Paducah Standard, as solicitor, making free-hand drawings of the names of people who wanted to subscribe or advertise. Occasionally when some one hadn't treated him right he would have revenge by making alleged likenesses of the offender — he having then fallen upon the Hoke chalk-plate method. After the publication of one of these the offender either suicided or reformed. The paper got into financial difficulties and Barclay, though the paper could stand for the cuts he had made, couldn’t stand for the ones they made in his salary. The paper failed to square up any better than the engraver's eye-measured cuts. Then the artist borrowed enough money to take him for a visit to his nearest relatives, at Bowling Green, Kentucky, with whom he stood a good prospect of making an extended visit. To his surprise an enterprising man with a daily paper—Col. John B. Gaines, of the Park City Times—gave him a place the very next day after he had landed, and before he had had a chance to spend even half of the $1.75 with which he had lit. 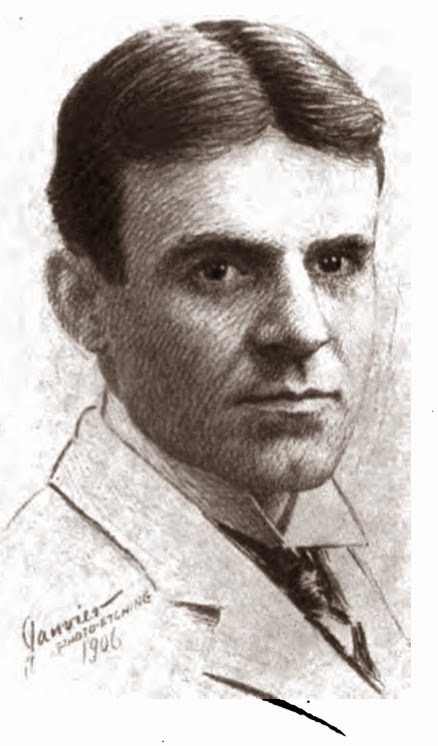 Later he ran an illustrated weekly with Euclid C. Cooksey, at Bowling Green. The weekly caricatured and roasted with all the zeal of the tyro proprietor everywhere, until it became distinctly visible that the sheet could support but one person. Then Barclay sold out his interest to Cooksey, having a balance of $19.75 after paying all debts—“the record for all time for all men who ever ran a weekly,” says Barclay seriously. 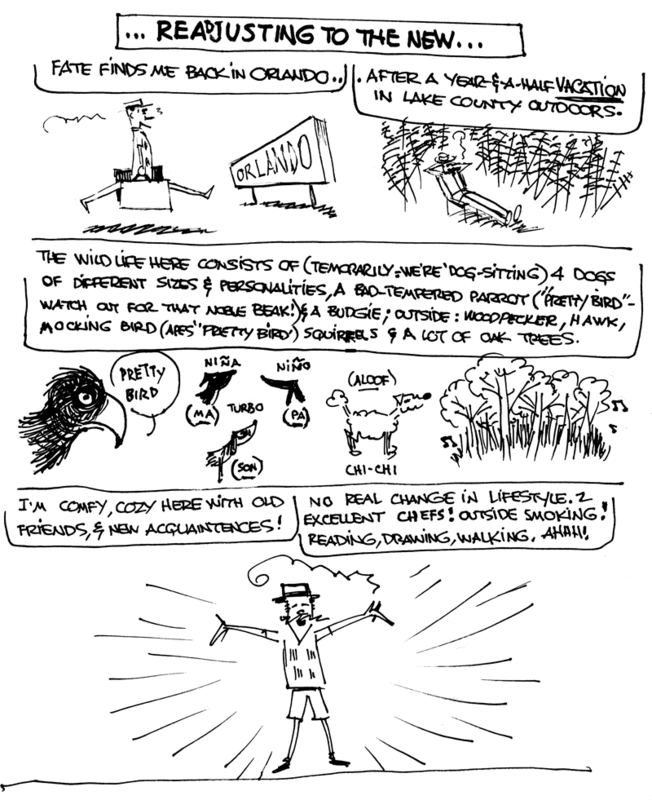 He does a great deal of book illustrating, etc., outside of his regular cartoon work, for he is an indefatigable plugger, never hurrying, but turning out an incredible amount of excellent work. Cartoonists can not be compared, but there are no better than McKee Barclay. Like most of the other really successful fellows, he has a wife and family that any sane man would be proud of, and Barclay is sane to the thirty-third degree. His brother Tom 9art signature, “Tom Bee”) does excellent cartoon work and comics in a decidedly individual line, also doing legitimate illustrating and caricatures of high standard. McKee is struggling beneath the advanced age of thirty-six years, and his best work is yet in his rosy-hued future. Charles Hewitt “Duke” Wellington was born at Edore Central Township, St. Louis County, Missouri on January 13, 1884, according to the Missouri Birth Records and his World War I draft card at Ancestry.com. His parents were James, a commercial traveler, and Josephine, whose maiden name was Hewitt. Wellington’s father died before the enumeration of the 1900 U.S. Federal Census, which said his mother operated a boarding house in St. Louis at 3863 Washington Boulevard. She also cared for her parents, Charly and Carrie Hewitt. 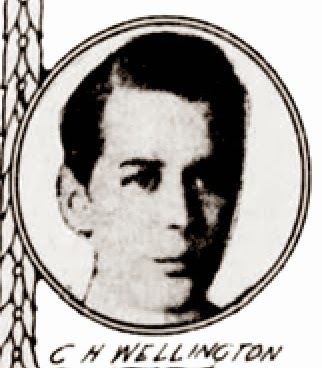 Wellington was not recorded there, but, according to Edan Hughes’ Artists in California, 1786-1940, “Wellington was educated at Smith Academy in his native city and at Washington University.” The 1901 St. Louis City Directory listed Wellington as a student who resided at 3863 Washington Boulevard. The 1903 St. Louis City Directory listed Wellington and his mother at 522 North Newstead Avenue. He was an artist for the Post Dispatch. The 1907 Memphis City Directory had listings for Wellington and his mother at 908 East McLemore Avenue. His occupation was artist, News Scimitar. 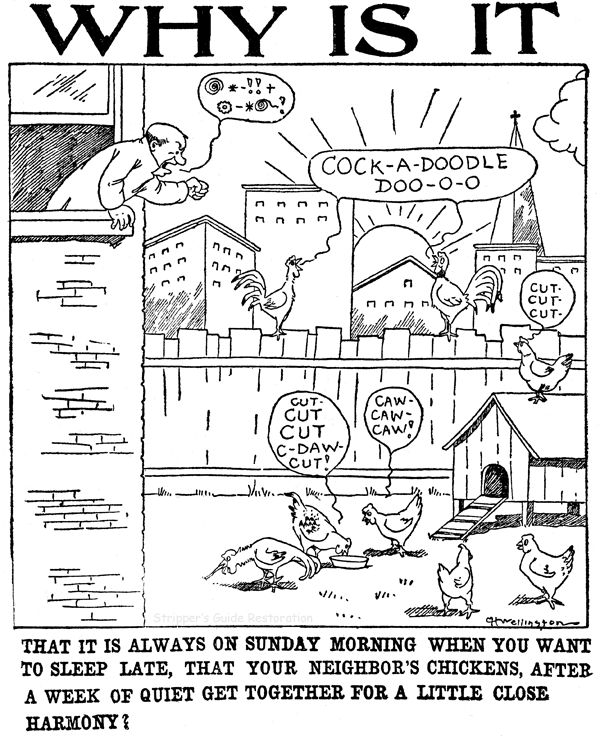 The New York Times, April 2, 1942, said he was a cartoonist on the Memphis Commercial Appeal. A photograph of Wellington and other cartoonists appeared in the comic section of the St. Louis Star-Chronicle, June 18, 1905 (below). The exact date of Wellington’s move to New York City is not known. His first New York comic was Up-to-Date Fairy Tales for the the New York Evening World. It ran twice, on September 11 and 14, 1908. Hearst’s Evening Journal took him into their fold. 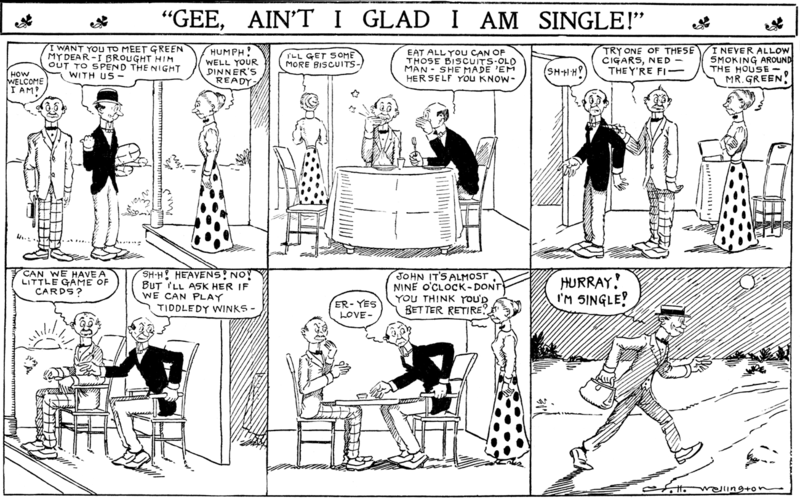 Some of the Hearst strips include: The Gimlet Club (1909–1910), There’s a Reason (1909–1910), Why All Men Are Not Married (1909), and For He’s a Jolly Good Fellow (1910). The Bookman, April 1910, said Wellington got his idea for There’s a Reason after reading an advertisement for Grape Nuts. He signed his World War I draft card on September 12, 1918. His address was the Friar's Club, West 48th Street, and occupation was cartooning for the Newspaper Feature Service. His description was medium height, slender build, and brown eyes. Wellington has not been found in the 1920 census. Artists in California said he moved to California around 1925. The 1928 San Fernando City Directory listing said the cartoonist lived with his wife, Emily, at 9920 Toluca Lake Avenue. In the 1930 census, the couple lived in Los Angeles, California at 9920 Toluca Lake Avenue. They had married in 1919. His occupation was cartoonist for the New York Tribune. Wellington’s address and occupation remained the same in the 1940 census, which said he completed four years of college. Wellington passed away April 1, 1942 at home. The Newport Mercury and Weekly News (Rhode Island) reported his death two days later. Charles H. Wellington, 56, creator of the comic strip, “Pa’s Son-In-Law, ” which ran in the Daily News for years until recently, died at his home, North Hollywood, Cal., Wednesday. 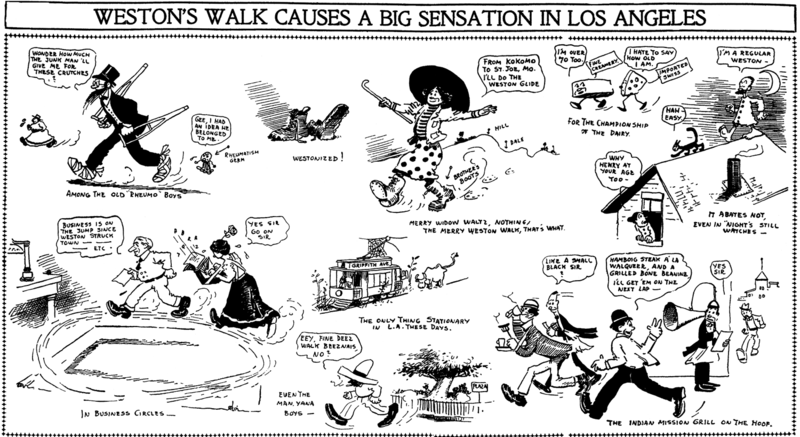 He created the strip, which was one of the most popular of the cartoons, in 1914. 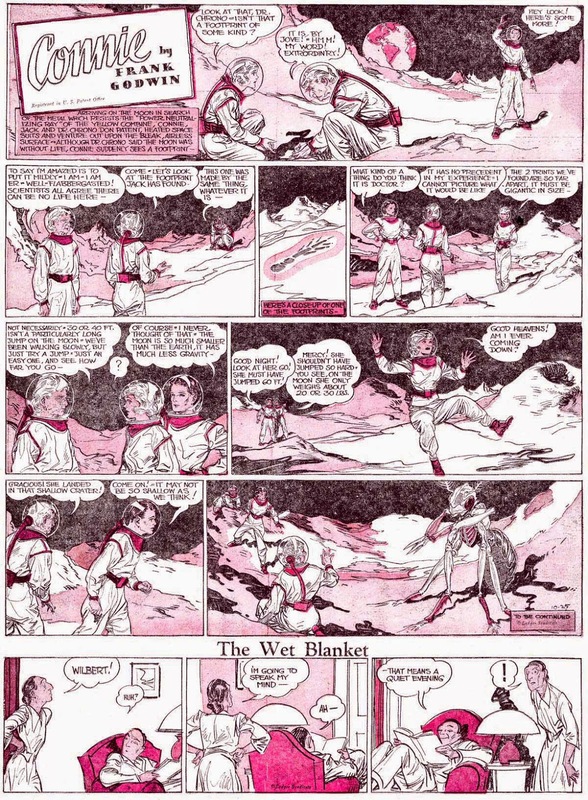 The daily strip, which ran in the Daily News from the New York Herald Tribune, was discontinued because of Mr. Wellington’s recent illness, although he continued his Sunday feature. Surviving are his wife and his mother.